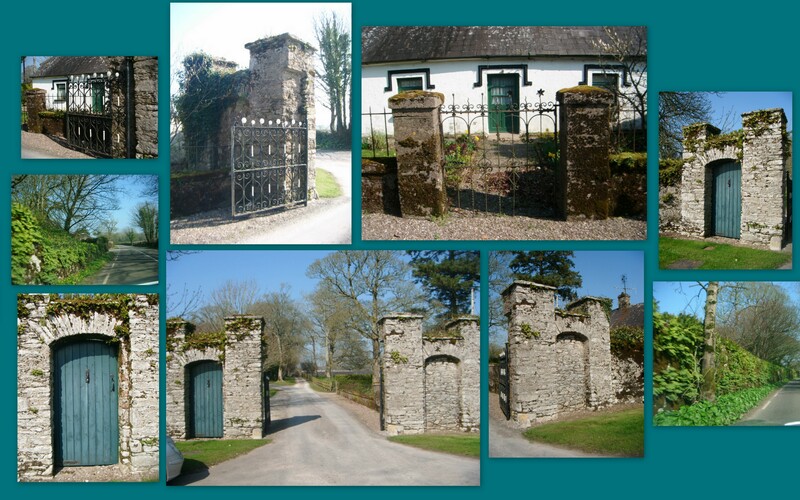 This is my journey of the gate houses or as I like to call them gate cottages of Ireland. 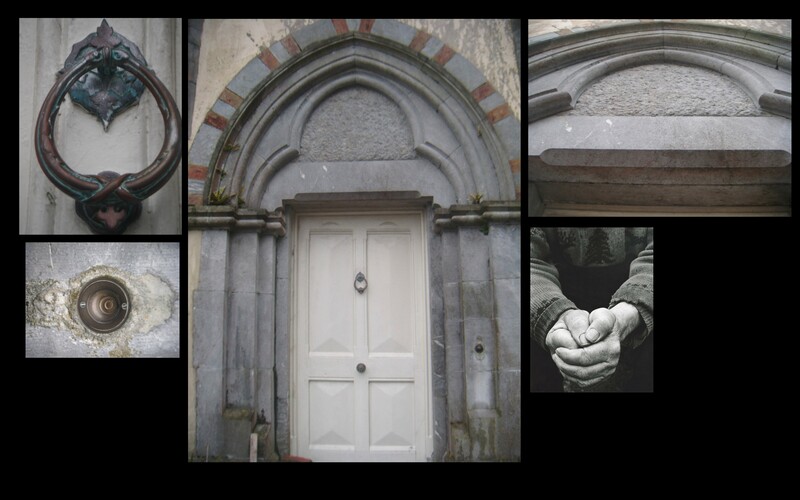 I live in Shanagarry a coastal village in the South East Cork and has always wanted to capture the beauty and mystery of these old buildings that was placed at the entrances of large estates. The first gate cottage I chose to capture on film and pen was the Ardavilling gatehouse near the village of Cloyne, Ireland. Here are the photos taken of the building. 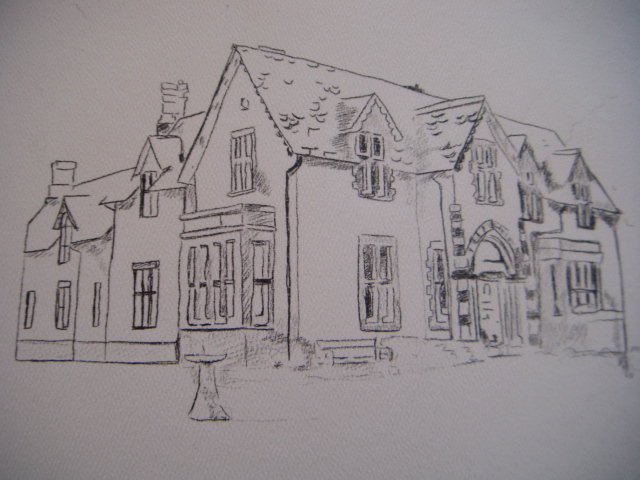 And the pen sketch I have made of the cottage. 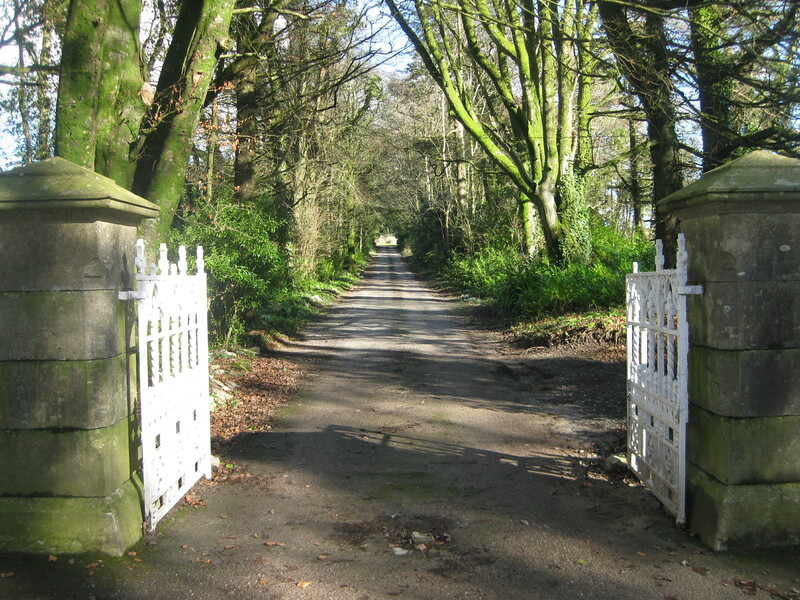 After taking these photos of the gate cottage I started wondering: who passed these gates…..who were they, what did they look like…what are their stories. And then the big question what does the estate look like. 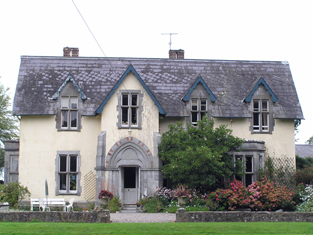 Like many estates in Ireland you can’t see the “large house” as it is called. Sometimes all you see is a peek here or a peek there, just like a pretty girl wearing fancy underwear peeking through her lace top, just enough to entice but not enough to satisfy. 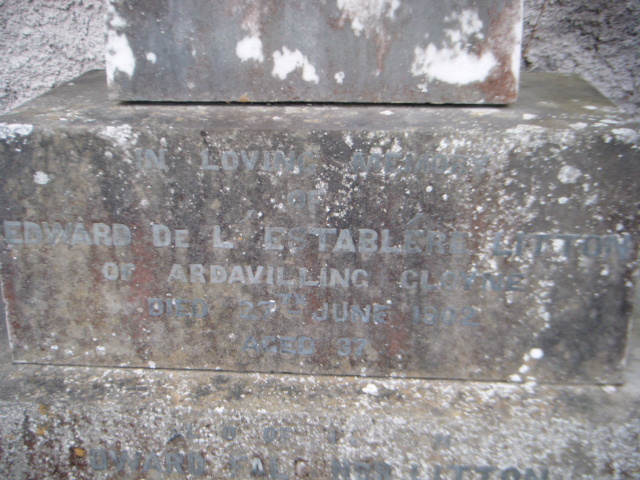 So I did a bit of research on Ardavilling…. and this is my story. The first registered owners were the Littons it was thought that they came from Littondale in Yorkshire and moved to Dublin in 1660. He married Gertrude Verdoen who was from Dutch decent. The property was left to his son. Edward chose the army as a career and served in the American War of Independence. 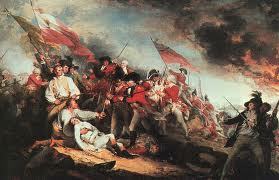 He was wounded in the battle of Bunkers Hill in 1775. After returning he married Esther Letablere on the 23 June 1783 in St Anne’s cathedral. Esther Charlotte Letablere was a very important addition to the family. She was the Granddaughter and heiress to the rich family history of Rene de la Donesque who was lord of the Manor of Letablere in Lower Poitou an ancient family in France. They were a Huguenot family who left France in 1685 and at the age of 22 Rene served in the military in Holland and was involved in the Battle of Boyne after that he settled in Dublin. His son was Daniel Letablere that was Dean of Tuan. He was directly involved in the silk industry in Ireland. Edward also had a Dublin address at 67 Merrion Square. He was educated at TCD were he studied law. He was called to the bar in 1847 and made a QC in 1874. He served in Cork and Wicklow circuit. Also elected Liberal MP of Tyrone in 1880/1 Judge of the Supreme Court in 1890. He was described as having a cool, clear and calculating head an able and good Judge that could discern truth from falsehood. He was patient and courteous to everyone. Adelaide Trottter of Galway- 1 daughter. 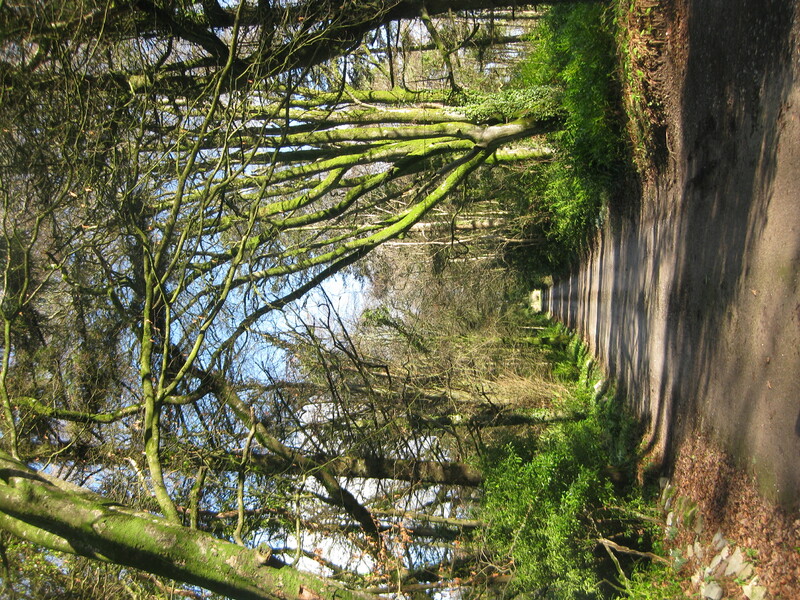 It is said that the Judge contemplated his cases while walking up and down this lane of trees . 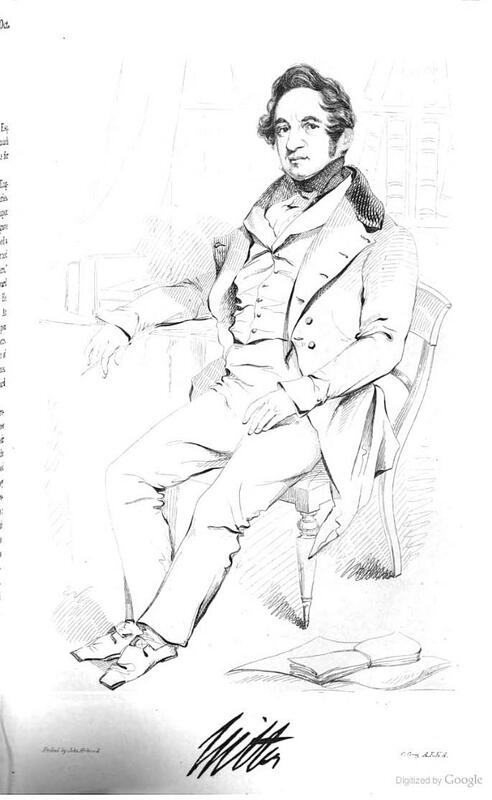 Judge Litton took upon himself the task of improving the water supply which his uncle had given the town some years before.The earlier supply of water was welcome but proved to be impure. Judge Litton set out to alter this. 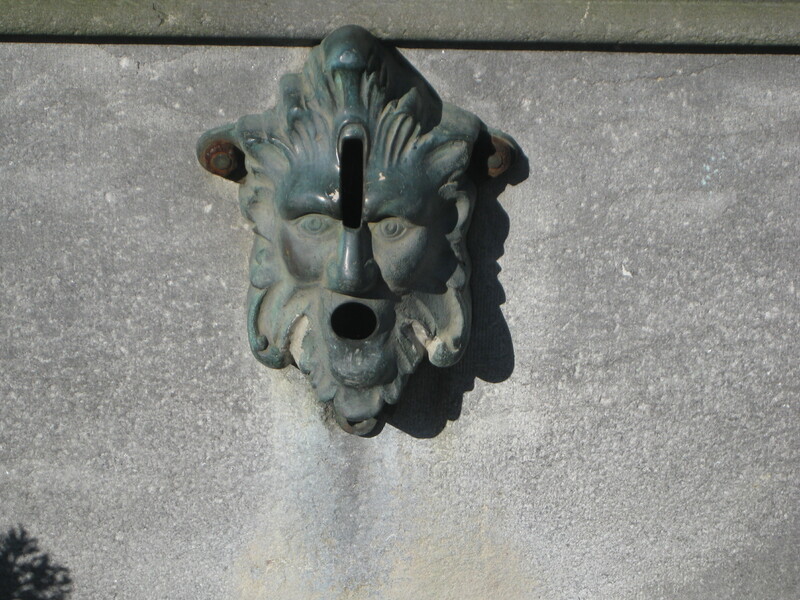 He set up a reservoir on his property at Ardavilling and piped it to the square of the town of Cloyne were a public fountain was erected for all to use. It was presented to the town in April 1879. Vast amounts of people gathered in the square (including many local VIP’s) Mr Litton quoted a rhyming couplet-his wish for the fountain was “pure and pellucid may its waters flow, neither rapidly swift nor obstinately slow”. 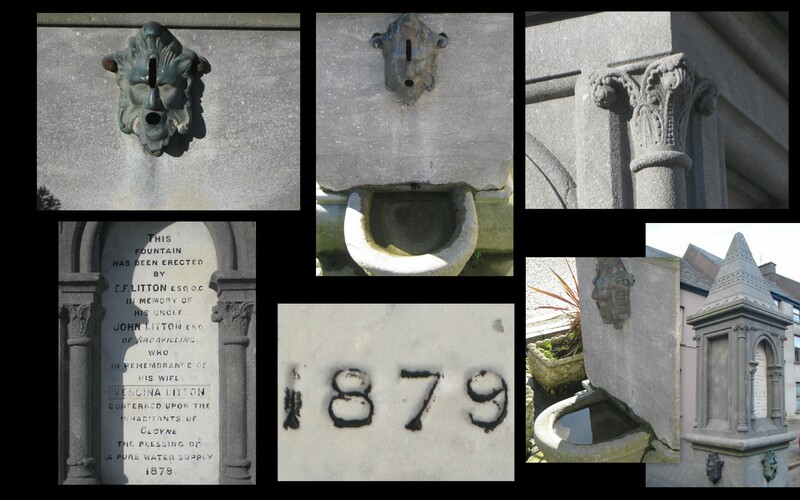 Unfortunately the fountain has ceased to flow from 1912 when Cloyne’s water supply was updated. It was the Judges custom to enjoy a holiday break at the Ardavilling house and it was in the course of one such, and as a result of being engaged in supervising alterations on the house that he caught a chill that developed in pneumonia. 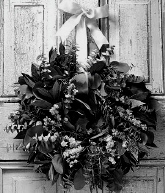 A wreath of laurel, yew or boxwood was tied with black ribbon and hung on the front door. 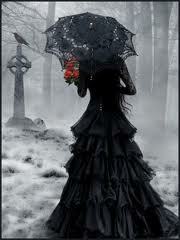 Curtains will be drawn and clocks stopped at the time of death. Mirrors were covered with veiling to prevent the deceased spirit from getting trapped in the looking-glass. A body was “watched” over for 3 to 4 days to allow relatives to come from far. Family photos were turned face down to prevent them being possessed by the spirit of the dead. 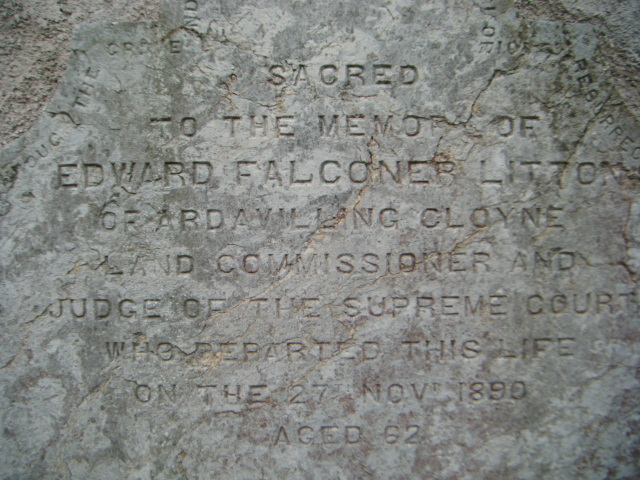 The Judges wish was to be buried in Cloyne although the rest of his family was buried in Mt. Jerome cemetery in Dublin. The day of the funeral was wet and sleety but it did not stop it from being the biggest concentration of rich and poor in the town of Cloyne. The coffin was made of massive oak prepared by Mr Smyth, was borne in a hearse of John Moore of Midleton from Ardavilling House to the Cathedral in Cloyne. All premises were closed and blinds were drown. The service was held by the Dean of Cloyne. The Judges 4th son became the next owner of Ardavilling house he qualified as a Barrister and settled into his fathers practice. In 1894 he married Ida Gordon of Dublin and died on his 37th birthday from internal haemorrhage. 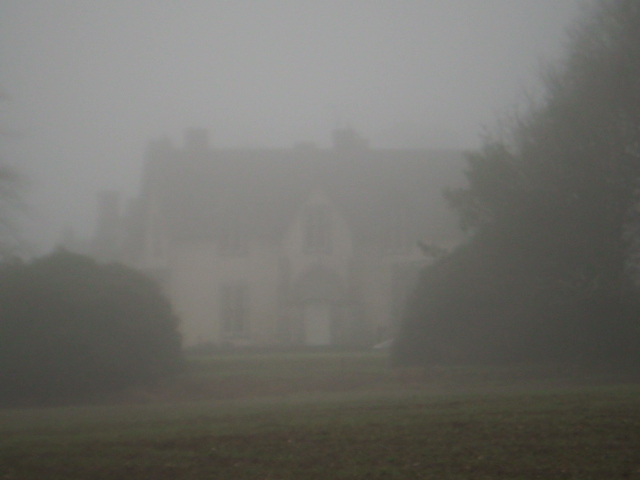 I had no choice but to drive down that road to see the Ardavilling house. It was as if I had a connection to this house and this family. Many of the people I meet say: “You can’t just drive in there and ask them to take photos, others say of course you can go”.. The longer it took me to pluck up the courage the more difficult it became. 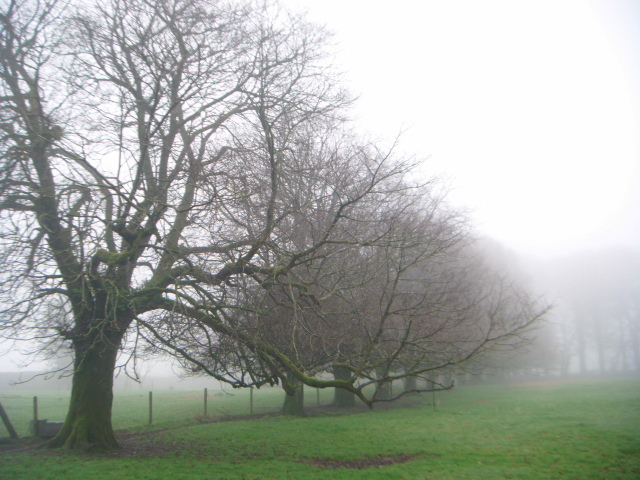 So one very rainy, misty day I got in the car and…. There it was….. 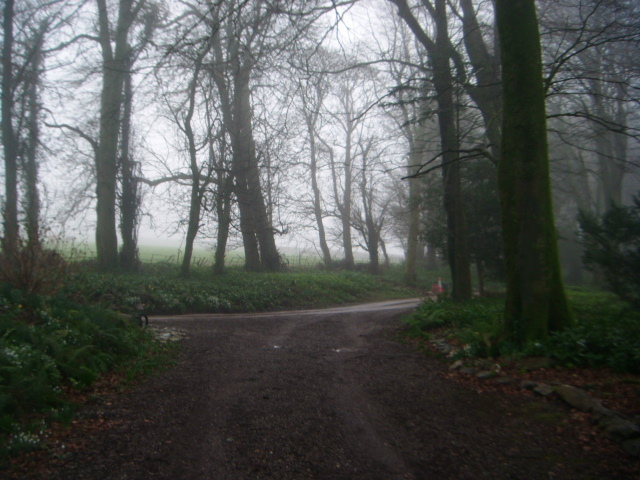 …..I could see the out line of the house in the distance as I turn the corner in the road. I just have to get closer, I can feel the excitement and anticipation level rising. The Ardavilling house was built between 1850 and 1860. Therefor in the Victorian period when there was an interest and revival of the Gothic architecture. This house has a very ecclesiastical feel. The Victorians drew from history, geometry and personal inspiration to create their designs. Medieval styles where reinvented this style harked back to medieval castles and cathedrals. Houses were also very much a statement of taste and education. 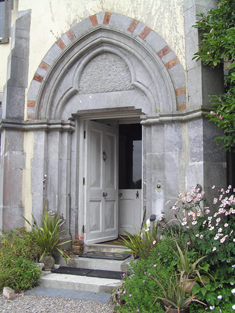 Here is the front door: Pointed arch carved limestone door surrounded with recessed archivolts, trefoil arched spandrel and square-headed door. The door is probably the most impressive part of the building. I added the hands as I was wondering who could have been responsible for the highly skilled stone masonry. 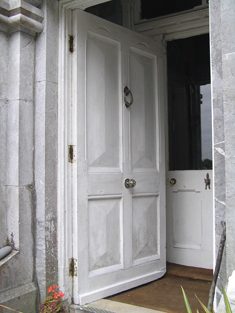 The front door opens to an interior porch. Steeply pitched slate roof and look at the fish scale patterned slates. Corner buttresses in cut limestone. 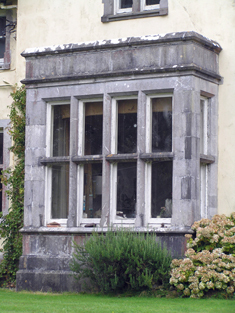 Flat roofed limestone bay windows. 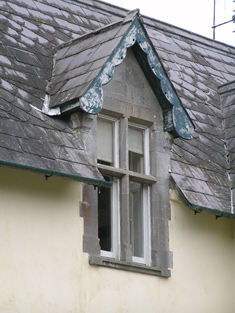 Narrow windows with a highly decorative front. 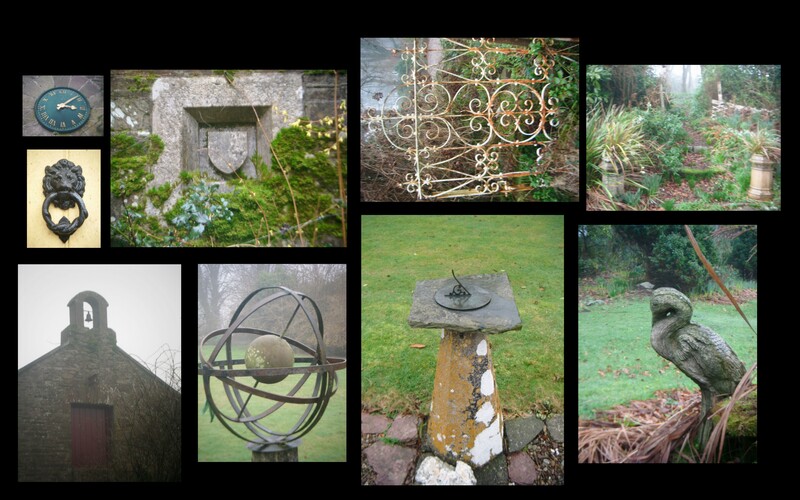 There are also extensive outbuilding and there are many traces that the garden was decorated in the Victorian style. 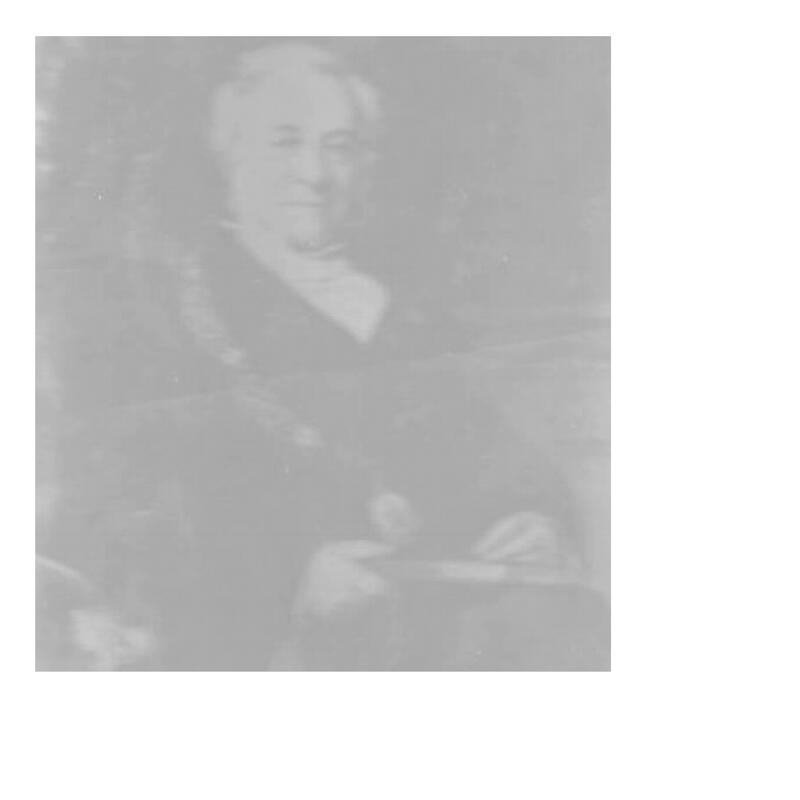 While doing research on the Littons I came across a Facebook discussion that Mike Litton (Edward Michael Francis Litton) had with a family member and the mention made that he was direct descendant of Judge Edward Litton. 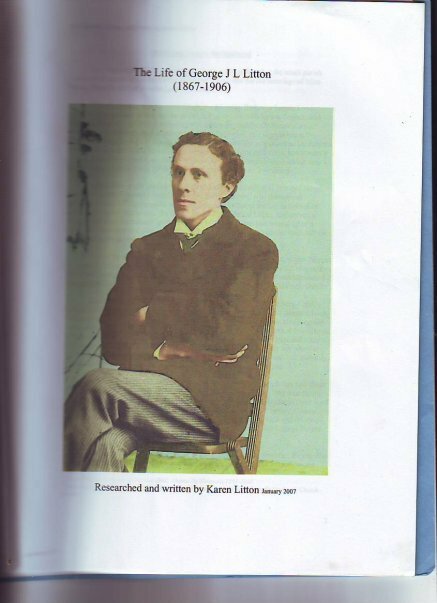 I came in contact with him , his mother (Edwina) and family and learned their story: George John Letablere Litton was the British Consult to China were he fell in love with So Hopi ,a Chinese woman and had two sons. One of his sons George moved to Manila, Philippines and started a business and family there. As well as meeting Brendan Sisk, Cloyne. He helped me with research, advice and knowledge of the Cloyne area. Contacts can be reashed at my Facebook link at the right of the page. 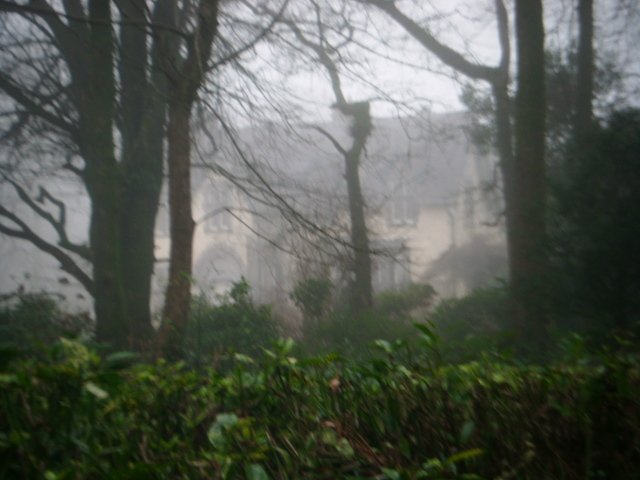 Is that then good-bye to Ardavilling and the Litton family that lived inside those walls. And were too next ….. I'm a house-historian that researches and documents the history of a house and the people that lived there. I bring together a snapshot of the story behind the house. This information is used by a variety of people from Historians to Architects, Estate agents, Ancestors or those generally concerned about the heritage of the property. Loving your Blogs Annemarie ! I live in Cloyne and am always wondering about this place and that. Let me know if you ever do a tour of the area. I have an interest in funerary architecture as well so if you know anything along those lines please post them up ! I just heard that Ardavilling House burned last night leaving only the walls standing. Very sad but at least no deaths. 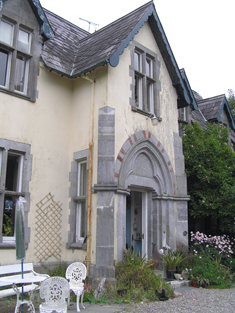 A blog dedicated to the storey behind the house and the beautiful Gatecottages and manor houses of Ireland. For those that are curious about these old houses, you're very welcome.